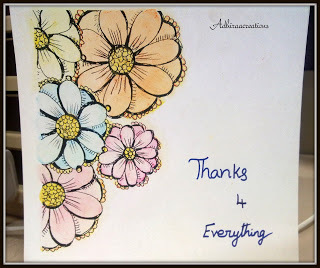 200 blog Followers! Time for Giveaway! How is it going with the current flavour of the month-projects dedicated to MOM?I hope you are all having fun.we definitely are having our share of fun going through your creations. I am here to show you all my inspiration for the month with this super cute washi bow. Hey folks...This is Indira here. As promised, I am back with my post to showcase the lovely Washi Tapes. 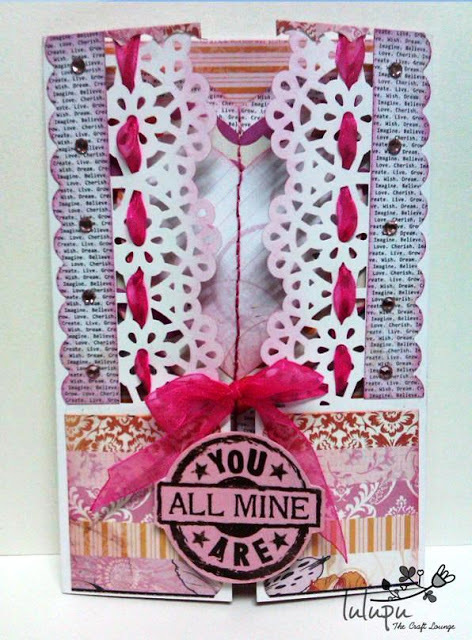 This is a Gatefold card with Love theme. It's a super quick card. I have used only one washi tape from the set that came in the Lulupu DT kit and I just went ahead and experimented with it. 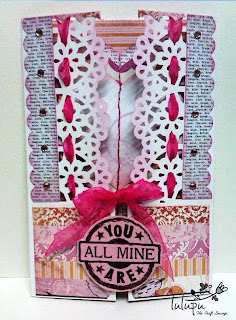 I have used the Pink Flourish print washi tape here. You can see the opened card alongside. 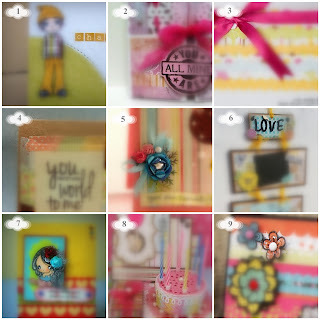 Die cutting with washi tapes! Lulupu has the largest collection of washi tape designs in India and so no surprises that I own quite a few of them. This is Indira here with a tute to upcycle a cardboard box. Incidentally, it also showcases the fabulous use of washi tapes, which is our highlighted product for this month. But yeah that is just a mere co-incidence. I will be back again with another post for washi tapes. On to our post for today.... I made this cute and large storage box for a friend of mine. She wanted an empty box to store some goodies and gift it to her hubby. 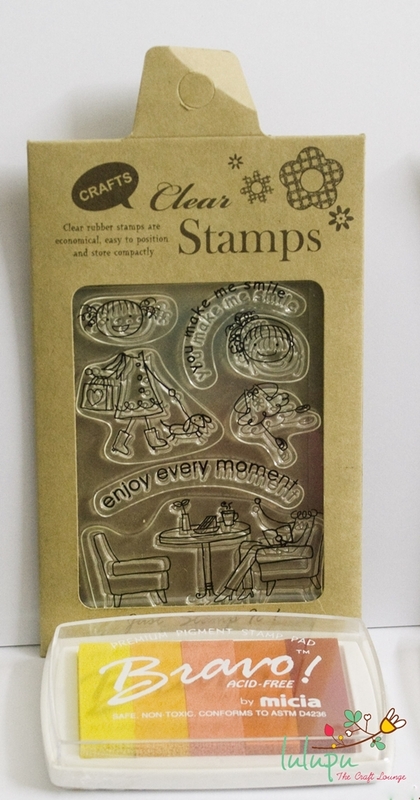 We know how much you all have loved our Micia Clear and Wood Mounted stamps and also the gorgeous inks and watermark pads! Here is your chance to get them now with a 15% off coupon code ending on 22nd April. Its Isha here and today its my turn to share my Washi Goodness with you all. Before moving ahead, I would like to tell you what WASHI TAPES are. Washi tapes are high quality masking tapes made of rice paper. The whole phenomenon of Washi tape started in 2006 in Japan. Earlier Washi tapes were known by the name of Japanese masking tape. But more than that Washi tape is a material which is beautiful yet useful at the same time. 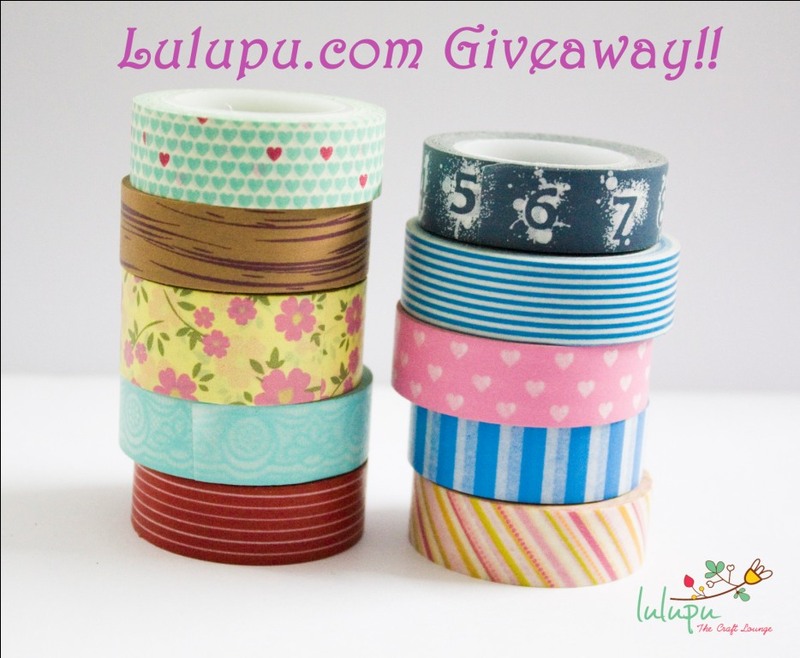 Who knows the fact that these beautiful strips of paper i.e., Washi tapes can work wonders on your craft projects!! 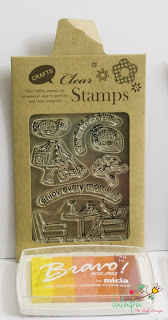 You can tear it, stick it, re- position it, write on it, stamp on it and even heat emboss on it .. The low tack adhesive makes it extremely easy to use and in fact re-use. I believe Washi tapes are easy to use yet add style, drama and glamour to your project and it's super fun to work with them . Hope you all are having fun creating beautiful cards and projects for your Mom. Please do make sure to link up your posts to our Challenge 11. Today I am sharing a frame I made and had fun with because I used loads of washi and fabric tape. I have been in love with papercrafts since a long time. From waterpainting in school to making collages in college to making cards ( a lot of them ) after marriage and now making scrapbook layouts for my husband and daughter, I have spent a whole lot of time (& money) on this hobby! 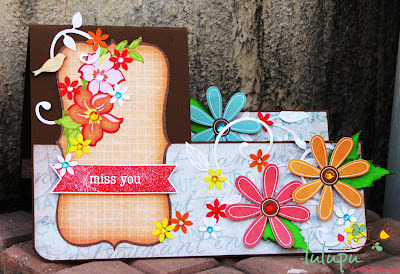 I remember buying quilling strips, tools and a fiskars spring-scissor on my honeymoon trip! The look on my husband's face was hilarious, that was the first time he saw the crazy crafter side of me. I should also say that he supports me lot in my creative pursuits and I am lucky to have him in my life. So, for this month's theme "My Mum, my world", I have created this card for her. My mum loves bright colors, so i wanted a bright one for her. 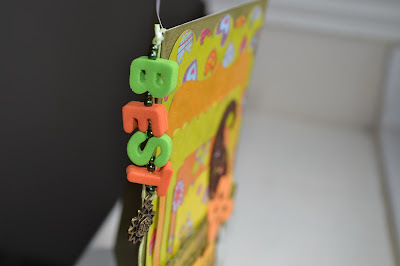 I find it hard to create layers on a card, so had them in a single panel and then embellished it with hard-to-find-orange-and-green stuff from my stash. Those alpha foam beads were the best find, bought them in Brussels some 2 years ago! Hope you guys like this one! 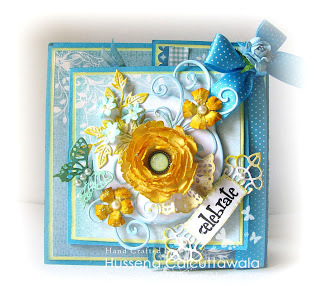 A very warm hello to all my fellow crafters from me, Tanvi. 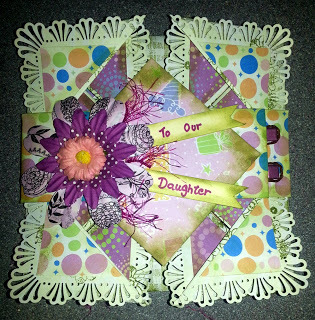 I started crafting seriously quite a while ago but blogging was a slow starter for me. However once it got started, I have not looked back & now am thoroughly enjoying this creative journey. Thank you Karuna n Team Lulupu for inviting me as GD for this month. 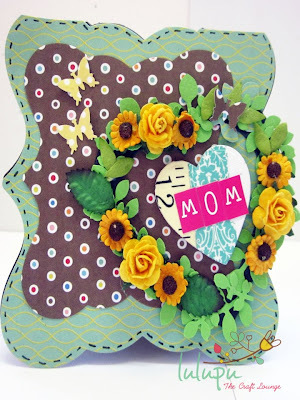 I am sure you will all create wonders for your mum’s as the theme is - MY MUM, MY WORLD!! 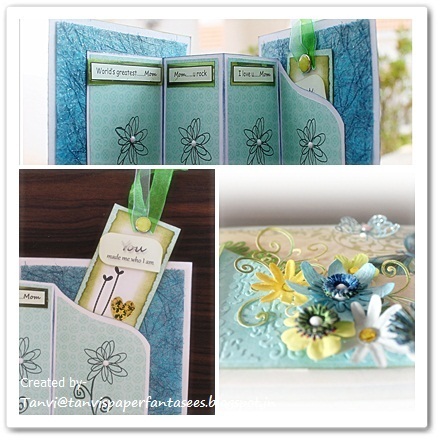 The twist this month is to incorporate many layers, so I added an accordion fold inside the card with a pocket to hold a tag. Adding so many layers also gave me the opportunity to use a variety of papers for this card - base card stock, PP, embossed paper, punched border & a beautiful textured handmade paper. Hope you all like this & share your creations by joining this challenge. Okay Ladies! We know you have been waiting for this announcement.. So here it is.. There are still two Birthday Contests left for which we haven't announced the winners. The first one was the Guess 'N Win Contest! Now the two lucky ladies who have won this are..
And now for the Crafty Quiz Contest. We know it was a looong quiz, but you have to admit it was fun right? But before we announce the winners, we want to share the right answers with you!! So here goes! Q1. When was Lulupu - The Craft Lounge Launched? Q2. How many pretty ladies have been a part of the Lulupu Design Team including the current members? Q3. This brand of Stamp comes in 3 sizes - CPS, CPM and CPL, and is sold on the Lulupu Store. Name this brand. Q4. Lulupu currently stocks this hot selling product in 4oz and 8oz bottles with variations of Gloss, Matte and Fabric. A versatile product for mixed media as well. Name the product. Q5. Name any 4 types of inks. Q6. Which of these brands is not associated with papers? Q7. Name any 3 Stamping Techniques. Even though these technically aren't Stamping Techniques, we will allow these as they are mediums used for stamping instead of Inks. Why? It is not a special technique. 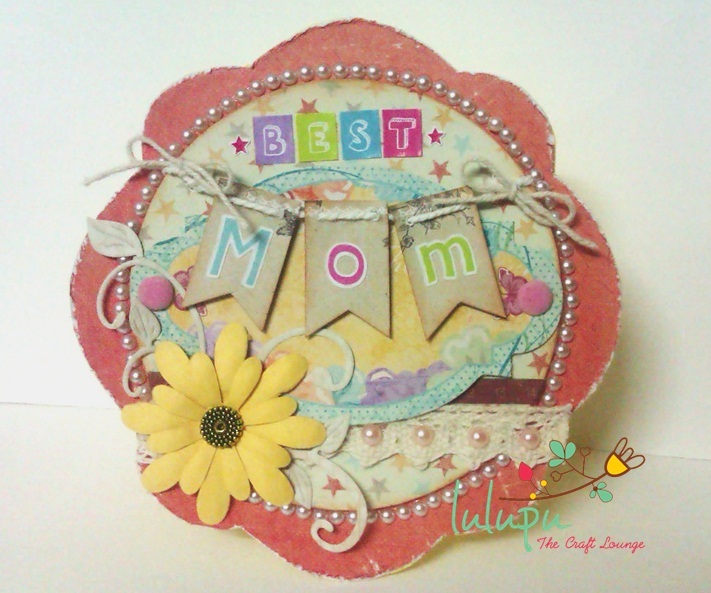 It is basic stamping which can be done using rubber or acrylic wood mounted or unmounted stamps. - Stamping with fresh leaves & vegetables - This does not really imply a technique but a method of using unusual products. Q8. Which of these cannot be used for Die Cutting? Q9. Tattered Rose, Walnut Stain, Mustard Seed... What are these? Q11. Name any 4 brands that make embellishments. Q12. Before it was launched as Lulupu - The Craft Lounge, what was the Store called? Name the Brand that manufactures the following products. 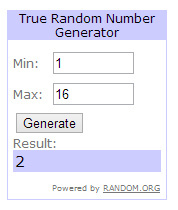 And the Random Winner is.... drumroll please!!! Congrats to all the winners and thankyou everyone for playing along and making our birthday month so special! 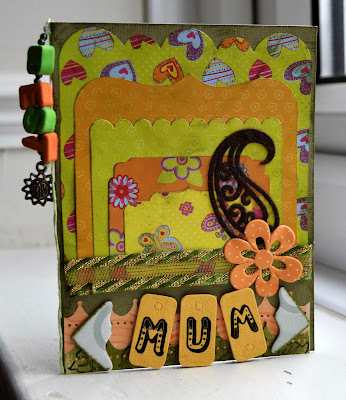 Hope you have checked our new Challenge #11 - My Mum, My World. We would love to see you play along this month! PUNCH OUT SALE is on!! Use Coupon Code PUNCHOUT10 when you buy 2 or more punches to get FLAT 10% off. Use Coupon code PUNCHOUT15 when you buy 5 or more punches to get 15% off. Click HERE to get them all now! *Coupon expires on 8th April midnight. We would like to thank you all for playing along at Lulupu's Challenge #10! 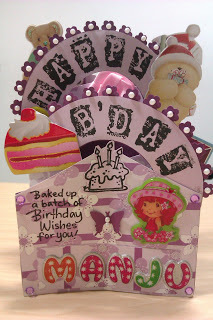 It was sure a challenge to pick an inspiration and to show your unique creations which would look totally different! 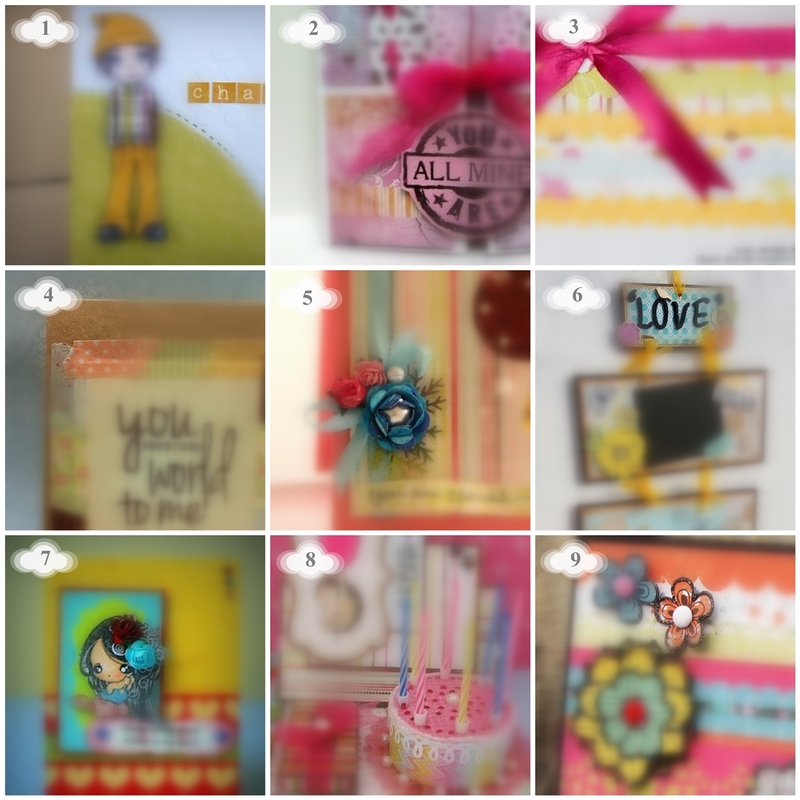 Challenge #9 was about creating a project by picking a DT inspiration and to show your creation. We enjoyed going through each and every entry and as always here are the DT's favorites and a Winner! 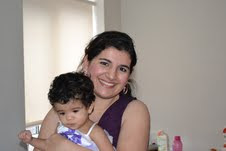 Congrats you have won a Rs.500 voucher to shop at www.lulupu.com. Please email us within 24 hours to claim your prize! But before we announce the Winner and Top 3 we would love to mention these beautiful entries which were heart stealers! They actually made it quite difficult for us to decide and we think they did a fantastic job and therefore, deserve a special mention. They are listed below in no specific order. Congratulations to all for their awesome entries and work. A fabulous take on the DT inspiration. Loved how the Birthday banner shows through! We were awe struck with the beautiful colours and soothing embellishments used by Hussena. She surely added her touch to the inspiration picked! Congratulations to you all! Please email us at hello@lulupu.com for your Top 3 Blinkie! And the winning entry for the month of March is our favorite.... its her second innings ;) ! 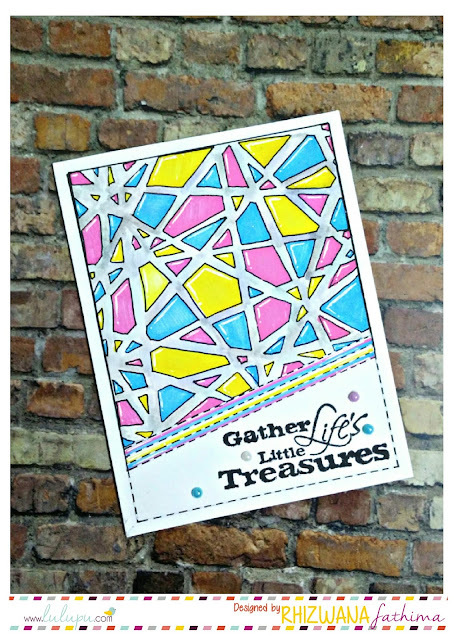 Loved the pattern papers colours used and so well coordinated! The belt is embesllished so beautifully as well. Please email us at hello@lulupu.com with your address to receive the hamper of DCWV Mat stack and pack of fabric flowers from www.lulupu.com and your Winner Blinkie! Hearty congratulations to all the winners. The Design Team will inspire you with their new projects throughout the month along with tutorials so stay connected! Lulupu Challenge #11 - My Mum, My World! So we're at the beginning of another month which means another challenge, and as Mother's Day is coming up next month, we have decided to honour the lovely ladies without whom we consider ourselves worthless! To participate , please ensure you follow all the rules . - Please link new entries only. - Only blog entries will be accepted which have a link back to our challenge. - Drop a message in the comment box to alert our DTs. - Linking to maximum of 5 challenges ONLY including this one to qualify. - Maximum of THREE entries per person , please add (2) or (3) for your second and third entry against your name. - International Crafters are welcome to participate too and if you win, your prize will be sent to an Indian address only. - Lastly please remove word verification from your Blog to help our DT leave comments easily. So are you guys ready to play? You know how this works. You have till the end of this month to participate and link up. We would love to see what you come up with.. You can submit your entries here..
Have a nice day!! And happy crafting! !